Carolyn Dear Woeber, Manager of Support and Consulting, Pointwise, Inc. The reduction of the drag force on all types and shapes of objects has historically been, and remains, a major focus of aerodynamicists and fluid mechanics researchers everywhere. Aircraft, automobiles, rockets, boats, and a multitude of other devices and components suffer from the ill effects of viscous and form drag. These effects lower the efficiency of devices, increase the operating costs, and shorten the lifetime of components. Reducing the magnitude of these drag forces means not only fuel savings and greater efficiency and capabilities in the operation of the devices, but a positive impact on the environment as well. In an age in which fuel efficiency and consumption are paramount areas of concern, even a very small reduction in the drag can prove extremely beneficial to the economic bottom line of the company, as well as to the environment as a whole. Considerable effort has gone into the investigation of drag reduction on various geometries over the years, including flat plates, airfoils, wings, and missile shapes. These techniques have most often been in the form of surface heating, plasma injection, surface perturbations (roughness), or blowing and suction of the boundary layer or tangential flow to achieve the desired goals. Varying degrees of success have been experienced through these techniques, but in many cases the physical systems required to accomplish the task are expensive and difficult to maintain in practice, when applied to a full-scale device. This has been particularly true of the blowing and suction mechanisms. Although not unduly complex to incorporate into a system such as an aircraft wing, they have been prone to contamination and require regular maintenance. The cost savings achieved through the use of such systems has been somewhat or completely reduced by the cost to maintain and refurbish the systems. The simplest types of flow control mechanism would have definite benefits, provided that they produce a reasonable positive result with minimal cost to implement and maintain the systems. Also, the power required to achieve the desired drag reduction must be factored into the equation. If the input power necessary to achieve the drag reduction is greater than the power saved through the drag reduction, then it is of no benefit whatsoever. For the present study, simple spanwise “strip heaters/coolers” were to be investigated. The goal was to examine the effect of heating or cooling various regions about the periphery of the cylinder, in order to examine the effect on the drag. In practice, these devices might be embedded flush with the surface of the cylinder, and the heating/cooling could be achieved, for instance, through electrical resistance heaters or hot gas flowing through passages for heating, or low temperature fluids flowing through passages for cooling. A study was initiated at Ohio Northern University by Jed Marquart, Professor of Mechanical Engineering, and Derick Endicott, undergraduate mechanical engineering student, to examine the effects on the aerodynamic characteristics of such heating/cooling arrangements on a circular cylinder in cross flow. The hope of the study was that it might lead to the ability to better control the drag over blunt objects such as cylinders. The original intent of the study was to examine a three-dimensional (3-D) cylinder with multiple spanwise strip heaters/coolers that could be activated individually, or in groups, to vary the temperature of portions of the cylinder surface above or below the freestream air temperature. Figure 1 illustrates the geometry of the cylinder, along with a sample spanwise heating/cooling strip. For this study, the strips were distributed completely about the periphery of the cylinder. A total number of 200 strips were selected to cover the surface of the cylinder circumference. 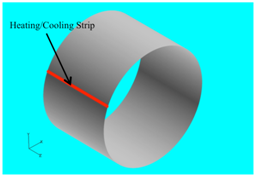 Figure 1: Cylinder geometry with sample heating/cooling strip. However, upon further consideration, it was determined that, for this initial effort, the overall behavior of the case could be more effectively examined using a two-dimensional (2-D) geometry, rather than the full 3-D. So, the geometry was modified to represent a “cut” through a 3-D circular cylinder at the center of a flow volume, to simulate an infinite-length cylinder. Thus, the geometry became 2-D in nature. Planned future efforts focus on incorporating the 3-D geometry and boundary conditions, as well as including appropriate turbulence models to capture the 3-D wake. The flow geometry modeled was a 2-D circular cross-section cylinder with a diameter, D = 1.5 inches, centered at the coordinates x = 10 inches, y = 6 inches. The flow domain surrounding the cylinder consisted of a rectangular outer boundary, with the front (inlet) being 10 inches upstream of the center of the cylinder, and the right (outlet) boundary being 30 inches downstream from the center of the cylinder. Upper and lower boundaries were located 12 inches above and 12 inches below the center of the cylinder. Thus, the overall dimension of the flow volume was 40 inches in width and 24 inches in height. See Figure 2 for the layout of the cylinder and the flow volume. All outer flow volume boundaries were sufficiently separated from the cylinder to prevent unintended effects on the flow about the cylinder. Figure 2: 2-D flow geometry with cylinder and boundaries. 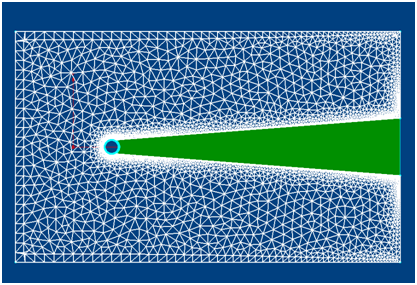 The computational grid was created using the commercial grid generation software package, Pointwise. 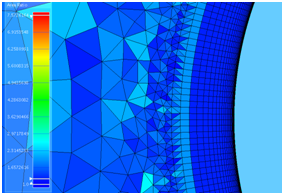 Pointwise is capable of creating high quality surface and volume meshes on complex geometries. Unstructured, structured, and hybrid grids may be created, composed of a variety of cell shapes to meet the need of the user and the computational fluid dynamics (CFD) flow solver. 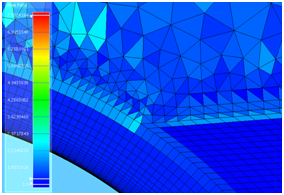 Pointwise, along with its predecessor, Gridgen, have been used successfully by students with no previous grid generation experience in the the undergraduate CFD course at Ohio Northern University for many years. The T-Rex extrusion method, featured in Pointwise and Gridgen, permits the generation of layers of anisotropic tetrahedra in 3-D, and anisotropic triangles in 2-D. The anisotropic triangles may be created in volume grids in 3-D, or flow domains in 2-D. These anisotropic cells were used to create a grid of more continuous cell sizes across the domain, to avoid large cell size “jumps” between regions and thus the introduction of artifacts into the flow solution. In addition, the use of anisotropic triangles/tetrahedra facilitated the joining of structured and unstructured regions in the grid, again controlling cell area variation, providing for a better solution, and reducing the total number of cells in the grid. Grid output from the code was user selectable in the proper format for many popular CFD flow solvers, including Cobalt. Various grid configurations and techniques were investigated, and a grid convergence study was performed. As discussed previously, and illustrated in Figure 1, the surface of the cylinder was created using 401 points, forming 200 separate regions on the cylinder surface, for future use as individual heating/cooling “strips”. The flow solver used for this work, Cobalt, is an unstructured solver, capable of accommodating cells of many various shapes, including quadrilaterals and triangles in 2-D, and hexahedra, prisms, and tetrahedra in 3-D, among others. The cell shapes utilized for the final grid in this effort included quadrilaterals, anisotropic triangles, and isotropic triangles. A structured boundary layer grid, composed of quadrilateral cells, was extruded from the cylinder. The initial cell spacing from the surface was 0.0001 inch and a geometric progression with a growth rate of 1.2 was applied to produce 31 extrusion layers. A structured wake grid was next created abutting the boundary layer grid and extending to the rear of the flow volume. In order to accurately capture the wake, the cells adjacent to the boundary layer grid matched the size of those of the last boundary layer extrusion layer, and grew in size slowly toward the rear of the wake grid. The remainder of the flow field, outside of the boundary layer grid and wake grid, was filled initially with isotropic triangular elements. Finally, T-Rex was applied to generate layers of anisotropic triangles in the unstructured farfield domain, adjacent to the structured boundary layer and wake grids. The overall grid appears in Figure 3. The boundary layer grid and farfield grid are shown in white, whereas the wake grid is colored green. 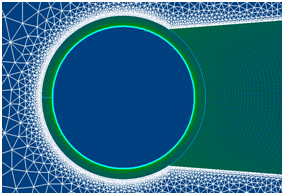 Figure 4 is a closer view of the cylinder, surrounded by the structured boundary layer and wake grids, which in turn are encompassed by the unstructured farfield grid. Figures 5, 6, and 7 demonstrate the smooth transition in cell areas between the structured and unstructured grids, as well as the cell size growth within the various grids. These images are plots of the cell area ratios at the intersection of the boundary layer grid, wake grid, and farfield grid (Fig. 5), the forward stagnation point area (Fig. 6), and the rear stagnation point area. It can be seen that the cell area ratios are low in the transition regions, and in fact, throughout the grid. Figure 4: Closeup of boundary layer/wake/farfield grids. Figure 5: Cell area ratio distribution at boundary layer, wake, and farfield grids intersection. Figure 6: Cell area ratio distribution at boundary layer/farfield grids intersection at the forward stagnation point. 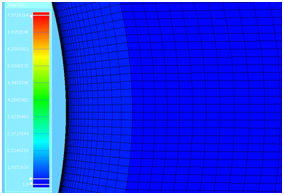 Figure 7: Cell area ratio distribution at boundary layer/wake grids intersection at the rear stagnation point. The final grid was composed of 39,852 points, 83,730 cell faces, and 43,882 cells. When run using the Cobalt flow solver, the grid was evaluated to have a grid quality, under the Cobalt criteria, of 98.52 percent. The values of y+ achieved were in the range of 0.093. The next step in this effort will be to examine cases in which only a portion of the cylinder will be heated or cooled, as opposed to heating and cooling the entire periphery of the surface. This will still be done, at least initially, using the 2-D geometry. Each of the segments constructed on the 2D grid represents a “heater” or “cooler” region, which may be set to any prescribed temperature desired on an individual basis, or each may be assigned a specified heat flux. These heated or cooled segments, on this 1.5-inch-diameter circular cylinder, are each 0.0236 inches in length, and may be turned on and off separately or in patterns to produce the desired heater/cooler effect for particular cases. Two Re values were selected for investigation in this effort: 1×104 (Case A) and 1×105 (Case B). These two values were chosen in order to examine cases in a higher Re regime of particular interest to the authors. Yet, these two cases exhibit varying characteristics within that same flow regime for circular cylinders. See Table 1 for complete case descriptions. Table 1: Case descriptions. *Unheated cylinder (baseline) case. Cases A and B both fall into the “subcritical” flow regime for a circular cylinder. The subcritical regime is defined as existing within the Re range of: 300 < Re < 3×105. The flow pattern is characterized by a completely turbulent wake, and laminar boundary layer separation. The two Re values selected for the test cases provide a value roughly in the midrange of the subcritical regime, and one toward the upper end of that regime. At Re = 104 (the TrSL2 phase), transitional eddies may form along the free shear layers. At the Re = 105 (the TrSL3 phase), there may be bursts to turbulence in the flow about the cylinder, and alternating eddies will be formed. Flow over blunt objects in the higher Re regimes is particularly challenging to model computationally, due to the complex boundary layer, wake, and vortical structures present in this type of flow. Cases A1 and B1 represent the unheated, baseline cylinders cases. Their temperatures were specified as being equal to the freestream temperature, and thus the ΔT values were zero in both cases. For the other cases, the cylinder temperatures were specified as being either above or below the freestream temperature by the values given in the ΔT column. The ΔT values selected were -100, -50, -10, 10, 100 and 400° R. The same computational grid was used for all cases, and all options within the flow solver were set to identical conditions for runs within the same Case. In addition, the same turbulence model (Spalart-Allmaras) was used in the flow solver in all cases, in order to reduce the solution method variation, and thus provide the best possible correlation criteria. Cobalt was suited to this study because it has been widely used for many years, and has been validated for a variety of cases ranging from low subsonic to supersonic, across a broad spectrum of geometries. Of particular interest to this work was the fact that Cobalt has performed very well in the various drag workshops in which it has participated, as well as in the prediction of flow about similar shapes to the one in this study. As stated previously, the SA turbulence model was run in all cases for this work, in order to provide a basis for comparison, and fewest variations in terms of methodology, between all test cases. The inlet boundary was assigned as a “source” boundary condition, the outlet as a “sink”, the top and bottom boundaries were “farfield” conditions, and each of the cylinder surfaces (200 elements) were assigned as isothermal no-slip boundaries. All cases were run on a cluster of 12 Sun Ultra45 workstations, using 20 processors. The run time was approximately 1.8 seconds per timestep. Postprocessing was performed using FieldView. The first step in the solution process was to run a validation case to compare the Cobalt results with accepted data from the literature. Case B1 (unheated cylinder with Re = 105) was selected to compare with the data from Achenbach's experiment. Figure 8 illustrates the correlation achieved between the Cobalt solution and the Achenbach data. As can be seen, the two correspond very well from the cylinder forward stagnation point up to just before the point of flow separation at approximately 78° clockwise from the forward stagnation point. However, at that point they deviate from one another, and remain distinct from the point of separation on. As noted in the literature, and through previous experience, the SA turbulence model tends to predict late flow separation in highly separated flow. In this case, the discrepancy was due in part to the fact that the flow actually remained laminar up to the point of separation for this cylinder flow regime, and partially due to the nature of the SA model. However, the value of Re in this case was approaching the upper end of the subcritical range (3×105), and the SA model was run to capture the possible transition effects that could occur. Figure 8: Cp versus θ for Re = 105. 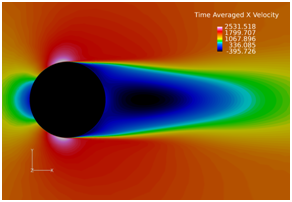 Although the data shows that the SA turbulence model predicted a late separation of the flow, the otherwise good correlation to the experimental data provides confidence that the solver was accurately predicting the flow up to the point of separation. Therefore, it was determined that the SA model would be used for all runs, since the object of this work was to compare the results of the heated and cooled cylinders to each other, not just to reproduce existing data. Table 2: Time averaged drag coefficients and percent change from baseline values. Cooling the cylinder below the freestream temperature had the effect of reducing the pressure, friction, and total drag for all of the lower Re cases (Case A). 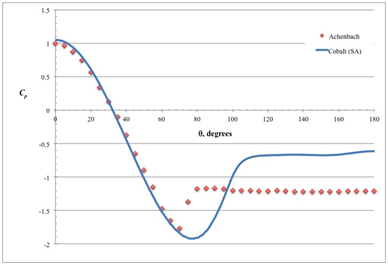 The value of the friction drag coefficient was reduced by cooling for Case A, but increased for Case B, the higher Re. However, the friction drag was not the major contributor to total drag at these Re values, so the net effect of cooling was a reduction in the total drag of up to 6.90% for Re = 104, and 11.71% over the baseline cylinder case for Re = 105. Heating the cylinder resulted in an increase in the pressure drag for both Case A and Case B. Heating produced an increase in the friction drag for Case A, but a decrease in the friction drag for Case B. The net effect of cylinder heating on the overall drag was an increase for both Case A (up to 11.68%) and Case B (up to 48.51%). Heating and cooling of the cylinder had a greater effect at the higher Re value of Case B. Additional studies will be required, but the initial perception was that the change in drag values by heating and cooling was primarily due to the variation in local property values within the boundary layer. Figure 9 shows the time averaged x-velocity contours for Case B1. Examination of all of the time-averaged solutions illustrated that cooling the cylinder increased the length of the lower-velocity core in the wake region, while heating the cylinder reduced the length of that low-velocity core. A detailed examination of the effects on the boundary layer and wake has not been performed, but will be in upcoming efforts. Figure 9: Case B1 time average x-velocity. Figure 10 illustrates three points in time for the time-dependent solution for Case B7, demonstrating the vortex shedding over time. Figure 10: Time-dependent vortex shedding (click here for an MPG). The time-dependent flow solution clearly followed the expected flow patterns, and the St values closely agreed with those in the literature given for these Re values. Plots of Cp and Cf are shown in Fig. 11 for Case A, and in Fig. 12 for Case B. For Case A, the most prominent effect was that of the 100 degree cooling case (Case A2) on the Cp distribution. Up to just prior to the point of flow separation, very little difference was observed between the cooling and heating Cp plots. From the point of flow separation onward, Case A2 demonstrated a marked deviation from the rest of the cases. This deviation continued for the remainder of the cylinder surface. The indication was that Case A2 provided much less negative Cp values in the separation region. Figure 11: Cp and Cf plots for Case A. The same basic effect was seen for Case B, but for this situation, it was Case B7 that showed the greatest effect on the pressure distribution. Again, all cases resulted in essentially the same Cp values up to just prior to the point of separation. After separation Case B7 showed a larger negative Cp distribution than the other cases. 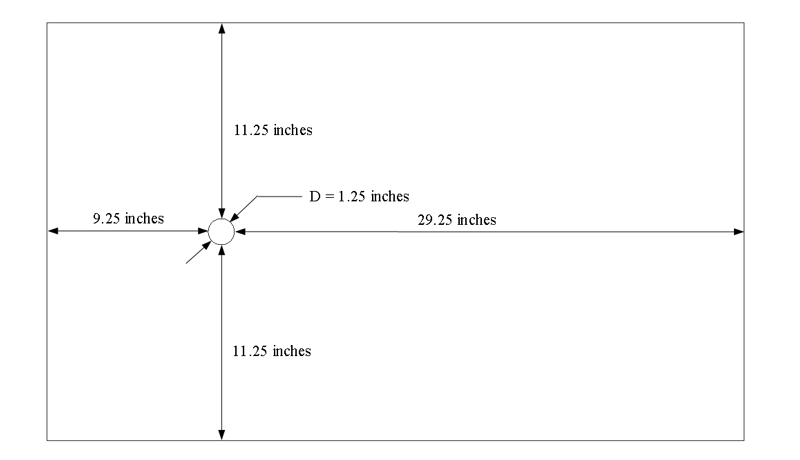 Figure 12: Cp and Cf plots for Case B. The predicted flow separation angle, given by the point at which Cf passed through zero, varied little from case to case for the lower Re value of Case A. The Cf varied somewhat between cases prior to the point of flow separation. However, all of the Case A cases predicted a flow separation angle of approximately 93 degrees. The higher Re case, Case B, exhibited considerable variation in separation angle, based upon the amount of cooling or heating on the cylinder. The separation angles varied from 89 degrees for Case B7 to 100 degrees for Case B2. The heating and cooling of the cylinder had a larger effect on the separation angle at the higher Re value. This observation reinforced the conclusion noted previously, that the heating and cooling have a greater effect on the drag at the higher Re value. In conclusion, two Re values were selected for examination, and cases were run with the unheated cylinder, as well as for several values of heating and cooling of the cylinder above and below the freestream temperature. Results indicated that the overall effect of cooling was to reduce the total drag, while heating produced an increase in the total drag. The drag increase or decrease was proportional to the degree of heating or cooling performed (i.e. the ΔT between the cylinder and the freestream air). It was also noted that the results were more pronounced for the higher Re value. Further studies will be perfomed over a broader range of Re to examine the trends. Also, more detailed analyses of the boundary layer and wake regions will be performed. This article is condensed from a paper presented at the 42nd AIAA Fluid Dynamics Conference and Exhibit. Research funding from Ohio Space Grant.